Self-contained power barge that can be positioned in ports, on rivers or in sheltered coastal locations. The Bahrain-based Arab Shipbuilding & Repair Yard Marketing Services Company (ASRY) and the British power generation packaging specialist Centrax Ltd have formed the joint venture company, ASRY-CENTRAX Ltd. The joint venture is set to equip a multi-application power barge utilising twin Rolls-Royce Trent 60 aero-derivative gas turbine powered generator sets with the aim of becoming a leading player in the production of barge mounted power stations. This will extend the range of power products offered by Centrax. 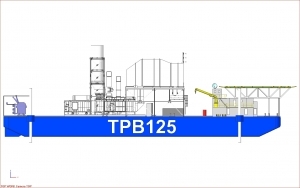 The TPB125 Power Barge is a joint development between Centrax and ASRY (Arab Shipbuilding and Repair Yard), in Bahrain. ASRY will build a floating self-contained Power Barge that can be positioned in ports, on rivers or in sheltered coastal locations. At its heart are two Centrax packaged Trent 60 generator sets producing a total of 125MW. The barge is designed to meet a broad range of power-generation requirements and provides the flexibility to be positioned rapidly. Commercial applications include the provision of temporary power supplies during the construction phase of new land-based coastal power stations, enabling plant operators to sell power well in advance of the new plant's commissioning. The barge also ensures continuity of power supplies during major outages at existing power plants near estuaries, rivers or coastal locations. Power Barges can also provide emergency power in times of need and humanitarian and relief initiatives around the world could also benefit enormously. The high power density and small footprint of the twin Trent 60 packages enable the barge to be transported readily from the ASRY yard in Bahrain and positioned to areas of need rapidly and with minimal coastal resources, where it can begin to deliver its high power output immediately. 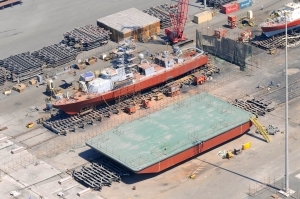 Two or more of these self-contained units can be linked together and equipped with a tanker barge or barges configured for the storage of liquid or LNG fuels. The units can either be connected to the local grid or operated as stand-alone island plants, ready to run at 100 per cent load within just 10 minutes from cold start. "This unique project combines the well-proven capabilities of Centrax as a leading packager with the most advanced aero-derivative gas turbine available today, providing a floating power station that can be positioned rapidly wherever it is needed at coastal or river locations around the world," says Guy West, Director Centrax Limited. "This system offers operators fast delivery of power where and when they need it, along with beneficial environmental performance. 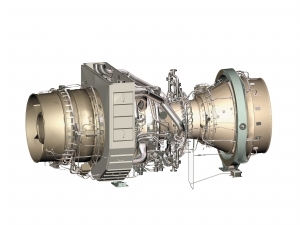 Delivering 125MW of power in simple cycle, the two Trent 60 packages on board set industry-leading standards for fuel economy and cost savings." 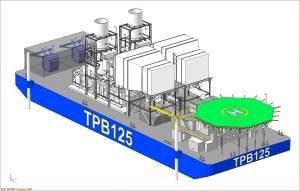 Power Barge 125 is designed with high cyclic life to meet daily peaking requirements. The vessel's double-skin fuel and oil tanks, low emissions and low noise (80dBA at one metre) also ensure highest environmental standards. Centrax Gas Turbines specialises in the manufacture and service of gas turbine powered generator sets ranging from 2500 kWe to 6,500kWe (Rolls-Royce 501K range), 8 and 15MWe (Siemens SGT-300 and SGT-400 gas turbines) and between 32 and 64MWe (Rolls-Royce RB211 and Trent 60 range), used for combined heat and power and base load, simple cycle and standby applications. ASRY started life as a super tanker repairer, the yard in Bahrain has developed into a ship repair and barge manufacturer as well as a maintenance provider for all types of ships, both commercial and naval, as well as specialist craft from the offshore oil and gas industry.